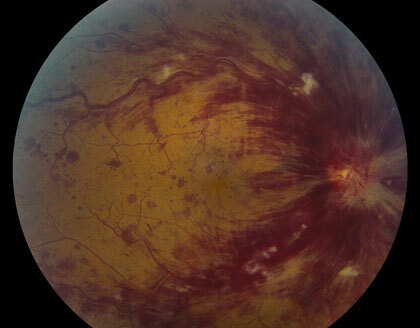 The diagnosis of a retinal vein occlusion is made through the examination of the retina, at the back of the eye, using special lenses and a microscope. Early on, specifically patterned patches of blood and fluid may be detected. However, this signifier often fades with time, making diagnosis more difficult. The less obvious signs of a vein occlusion may be unmasked with the aid of fluorescein angiography, during which dye is injected into to the blood stream. This allows circulation of the retina to be measured. Another advanced method, called Optical Coherence Tomography (OCT) might be used to measure retinal swelling and/or to gauge the response to treatment. Furthermore, Electroretinography, can be used to measure the eye’s electrical response to light flashes, at a cellular level. In some cases, this can determine the prognosis and guide treatment. Retinal vein occlusions appear to affect males and females equally. While the occurrence is higher in people over the age of 50, there are other significant risk factors, which may be prevented. Cardiovascular disease and diabetes both increase the risk of occlusions. High blood pressure and smoking triples the likelihood of disease, the latter inhibiting blood flow through hardening of the arteries. While you can’t change your age or family history, proper diet and a healthy active lifestyle can make great strides toward prevention. It is important to talk with both your medical and eye doctor to work on reducing personal risk factors. Signs of a retinal vein occlusion may include the dilation of retinal veins due to patches of swelling (edema) and/or blood (a hemorrhage) in the retina. Symptoms often include transient blurring of vision, which may last for hours or days. These episodes are usually followed by the onset of diffuse or segmental vision loss, which can be mild or severe. In a non-ischemic vein occlusion, where a partial blockage is present, vision loss may be mild. In an ischemic vein occlusion vision loss is often more severe and complications more common. Here, ischemia refers to a decrease in blood supply to the eye. It is possible for a patient, suffering from a peripheral vein occulsion, to be asymptomatic. Traditional treatment for vein occlusions includes the thermal laser method or simple observation (no treatment). Observation is indicated for patients who have non-ischemic (partial) vein occlusions and good vision (e.g., 20/30 or better). However, these patients should still be monitored closely; progressive vision loss may occur, along with other complications, which might prompt treatment. Laser may be used to improve vision for patients with significant macular edema or to reduce the risk of blindness due to abnormal blood vessel growth in the front or back of the eye. New treatments, currently being researched, include the intraocular injection of medications, such as anti-VEGF drugs (e.g., Avastin, Lucentis or Macugen) and steroids (e.g., triamcinolone acetate) to stop abnormal blood vessel growth and leakage. Surgical treatment is less common with the dawn of these new medications but it still exist. These surgeries may include a vitrectomy, with membrane peeling and laser therapy. For Branch Vein Occlusion, a sheathotomy might be performed or, for Central Vein Occlusion, a radial optic neurotomy. Newer treatments are now available that have proven successful in restoring vision; we specialize in these therapies here at the Retina Macula Institute.